Interested in learning more about Columbia palletizing? Stop by our booth to learn about the latest palletizing solutions. 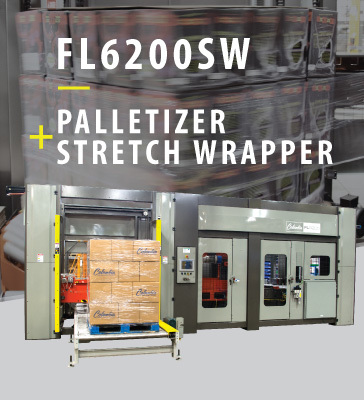 At Pack Expo 2017 Columbia Machine demonstrated the NEW FL6200SW high-speed, floor level palletizer including a fully integrated stretch wrapper that discharged onto the OTTO™ 1500 SDV that transported the full load around the booth without the use of guides. At Pack Expo 2016 Columbia Machine demonstrated the NEW FL6200 high speed, floor level palletizer that combines unmatched flexibility, zero-time changeover, the precision movements of a robot with the familiar simplicity of a conventional palletizer. At Pack Expo 2015, Packaging World interviewed Columbia's Sales Director, Ted Yeigh, to learn about their new HL6200 high speed row forming palletizer.